At noon on Feb. 8, right after President Claire E. Sterk's inauguration, Emory will launch its first day of giving — a concentrated fundraising campaign inviting donors to help write the next chapter in the university's story. What difference can 24 hours make in the life of a university? Emory is about to find out. Beginning at noon on Wednesday, Feb. 8, Emory will launch its first day of giving — a concentrated 24-hour fundraising campaign that invites friends of the university to support what inspires them in a way that can make an immediate and lasting difference. All In a Day: 24 Hours of Change will launch immediately following the inauguration of Claire E. Sterk as Emory’s 20th president, inviting supporters to “help write the next chapter in Emory’s remarkable story, ensuring we keep pace with a changing world and transform lives for the better,” says Kim Bowden, executive director of annual giving in the Office of Development and Alumni Relations. “What better time to rally and initiate support for the institution — to be involved in something both historic and groundbreaking,” she says. Through a dedicated website, allin.emory.edu, donors are invited to help move the university forward, from contributing to student scholarships and strengthening academic programs to funding transformational research and supporting innovative patient care. Within the landscape of university fundraising, days of giving are a relatively new strategy for rallying institutional support, Bowden says. But they’ve seen growing popularity across the country. “It’s a way to call attention to the collective impact that donors can have on an institution — connecting and engaging people in a meaningful way,” she says. “Over 24 hours, you can see in real time the number of gifts coming in, which allows donors to instantly see themselves making a difference while raising awareness of the importance of giving,” Bowden adds. 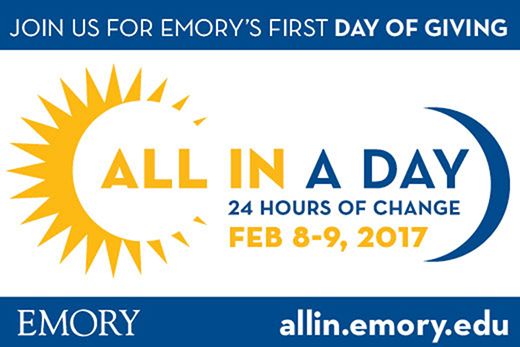 Prior to the launch of the campaign, donors visiting Emory’s “All In a Day” website will find a countdown clock and links for gift-matching challenges, a donor wall and frequently asked questions. Supporters are also invited to follow a link and register now as university ambassadors, digital leaders who are willing to volunteer to spread awareness before and during the campaign, Bowden says. Then from noon on Feb. 8 through noon on Feb. 9, visitors are invited to make gifts (directing support to any part of the university), check on gift-matching opportunities and fundraising challenges as they arise, and track donations, tabulated both as an overall total and as gifts to individual schools, units, programs and other participating groups. Scheduled during Emory’s Founders Week, which commemorates the first meeting of the Board of Trustees in 1837 following the founding of Emory College, the fundraising campaign is intended to raise awareness about the impact that giving has on the university. More information about the campaign will be shared with the university community via email as the event nears.